Photograph of Burmese Buddhist monks collecting alms, taken by Philip Adolphe Klier in the 1890s. 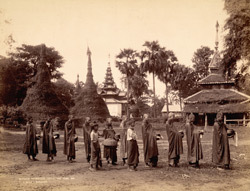 This view shows the monks, or 'pongyis' in Burmese, carrying bowls and posed in a line in front of pagodas. Theravada Buddhism is the state religion of Burma, becoming established during the reign of King Anawrahta in the 11th century, when he was converted to it by a monk from Thaton. Buddhist monks are accorded a reverential status by Burmese society and the monkhood or Sangha occupies an important place in the country’s religious and secular life. Collecting food offered by the community is a daily ritual in the life of a Buddhist monk.